MRTS stands for Mass Rapid Transport System. MRT is what we know as the fastest train that has ever built. This MRT, is usually found in some countries especially Singapore. This train was built to make good use to those people who have transportation problems. Most people in the countries that provided MRT usually use it for such as going to school or work. One advantage other than being so fast, it is cheap to travel in. It is at about two dollars maximum. 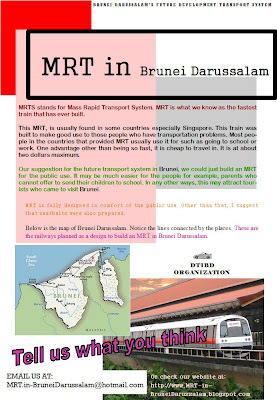 Our suggestion for the future transport system in Brunei, we could just build an MRT for the public use. It may be much easier for the people for example, parents who cannot offer to send their children to school. In any other ways, this may attract tourists who came to visit Brunei. MRT is fully designed in comfort of the public use. Other than that, we suggest that seatbelts were also prepared. By our calculations, Brunei is such a small country. In such definition, there will be not enough space for the building of MRT. 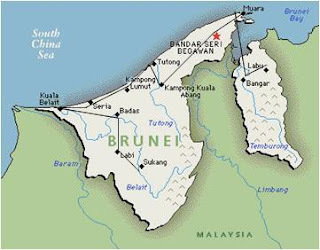 Above is the map of Brunei Darussalam. Notice the lines connected by the places. These are the railways planned as a design to build an MRT in Brunei Darussalam.